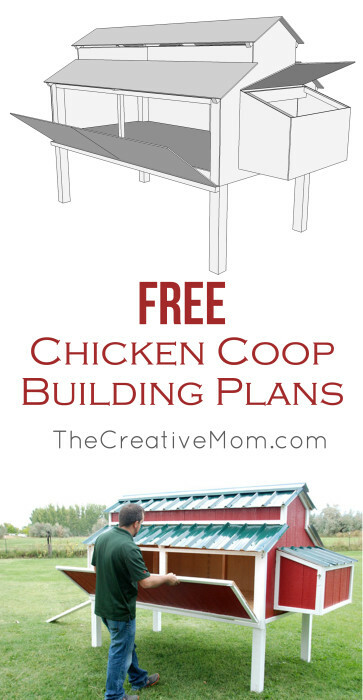 My free chicken coop plans are one of my most popular posts. I am excited to share them with you! Please see our FREQUENTLY ASKED QUESTIONS below, before building the coop. As it will answer many of your questions. What are Fence Brackets? Most hardware stores carry them, including Home Depot (for 67 cents). You can also find them here on Amazon, though they aren’t quite as cheap. How much did this cost to build? Since building material prices vary by location, this could cost more or less to build where you live. For me, it cost between $400-$500 to build. You could save money by using scraps, using less expensive paint, or less expensive roofing materials. But I built this to last, so I used the best of everything. Why are there variations in the plans and the photos? 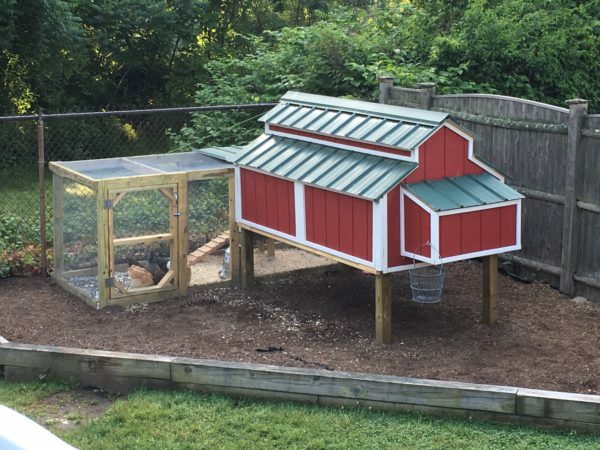 I built this coop, and then wrote the plans. As I was building, I made a few adjustments that I had to correct on the plans. If you follow the plan sketches exactly, you will be just fine! Is the ventilation adequate? I haven’t had a problem with ventilation. Although I’m not sure how I’d know, as I don’t personally live in the coop- haha! But with the eave vents and the open door, it seems that air flow is just fine. Does the coop get too hot or cold? We have the coop in the shade, so in the hot Summer months, it keeps cool. During the winter, we keep a heat lamp inside for heat and light. It seems to work fine. Where do the chickens roost? We have added some roosting bars inside our coop, as well as out in the chicken run. The chickens also seem to like to roost on the rafter beams. Where do you put food and water? Our food and water is outside in the chicken run. We keep a water heater in our water dish so it doesn’t freeze in the winter. How do you keep the coop clean? We fold the side of the coop down and scoop out all of the mess inside. Once it’s clean, we place wood shavings in the nesting box. I’ve also seen these inserts you can use in the nesting box, which look interesting, though we’ve never tried them. If you are worried about the OSB flooring getting spoiled, you could line the OSB flooring with a vinyl flooring, or seal with waterproofing paint. We have had this coop for almost 4 years, and haven’t had any problems with just using the OSB flooring. 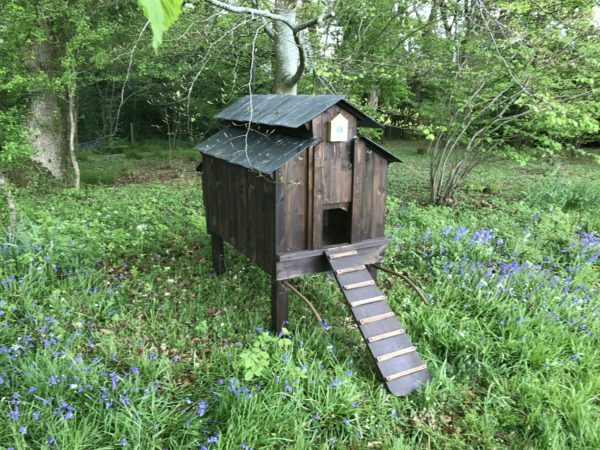 This lovely coop was built by Bernard. 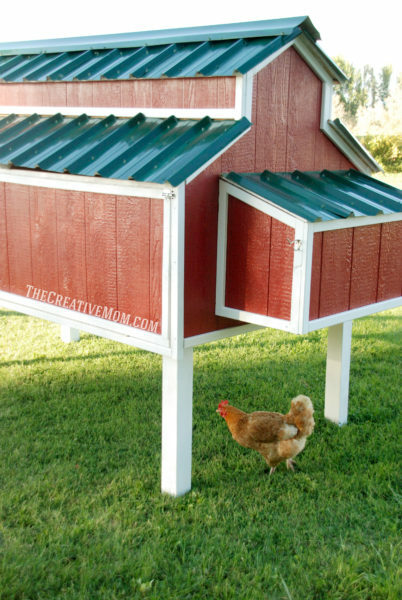 I love the rustic barnwood look of this coop. If I ever build a coop again, I think I might replicate the beautiful wood Bernard used here. 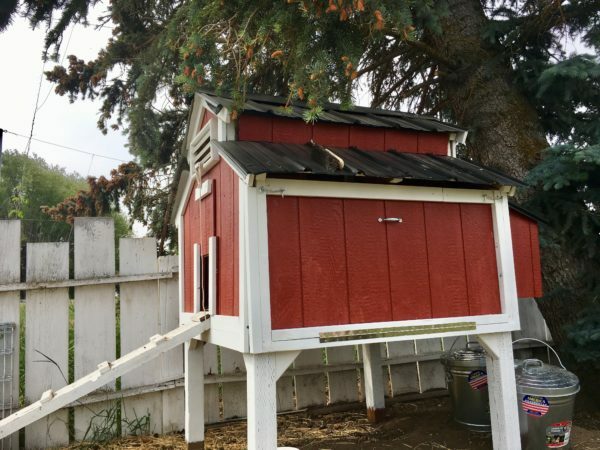 And I love this coop, which looks very similar to mine, but he added a door to keep the “bad guys” out at night. Awesome build by Brian. He also shared a youtube tour of the chicken coop, which you can see here. 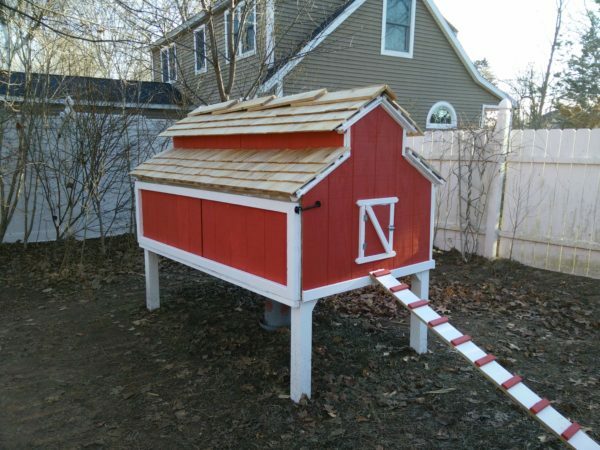 Here’s another red coop, similar to mine, but I love the enclosed chicken run. This is built by Anthony. It looks nice and neat. Perfect for a little flock. Thanks for sharing, Anthony. 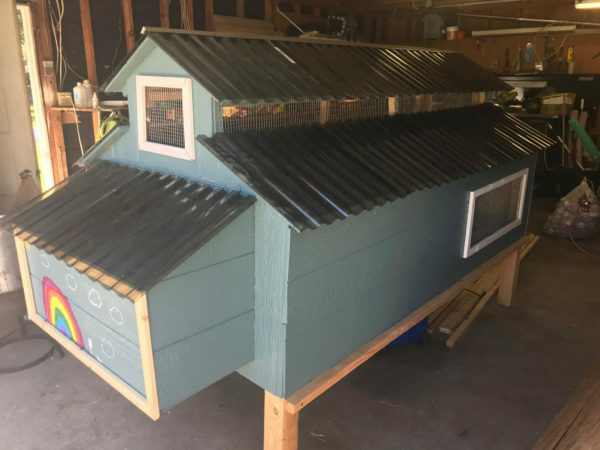 This cute blue coop was built by Mark. I love that he let his kids paint a rainbow on the nesting box. He added a few vent windows, and a see-through roof. Great ideas! The windows and transparent roofing would definitely help with the question some of you had about getting more lighting. Awesome build, Mark. 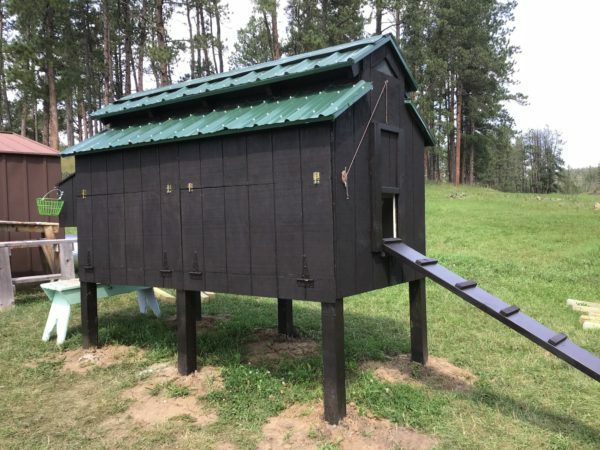 This is a DOUBLE long coop, built by Micah. 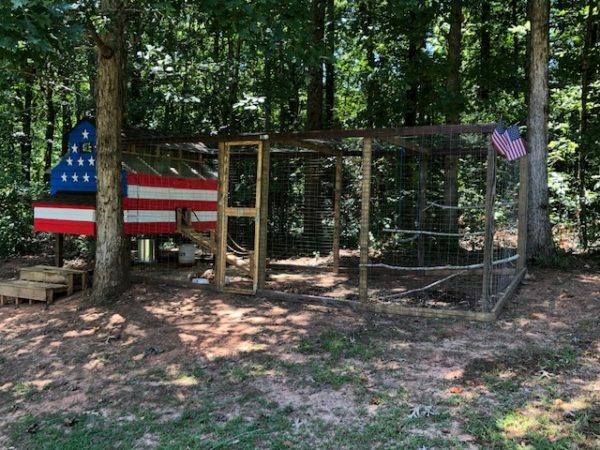 He is hoping to have 18 chickens or more, so he built the coop 16 feet long instead of 8 feet. He also added a second laying box, which will be helpful with the extra hens. He said the hardest part was moving the chicken coop outside! Micah also added power, which is really cool. It will be helpful to plug in a heat lamp during the winter. Great build, Micah! Here’s another coop built by Trevor. 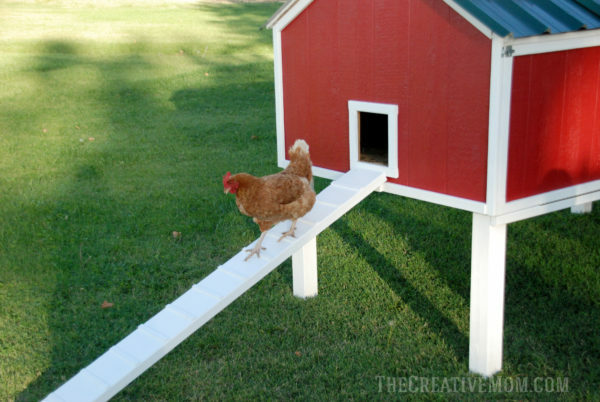 I love the little door he added where the ramp goes up into the coop. And that enclosed chicken run is very nice. I’m sure his hens are very happy there. Thanks for sharing your photos, Trevor. Here’s a cute little coop by Gabriel. 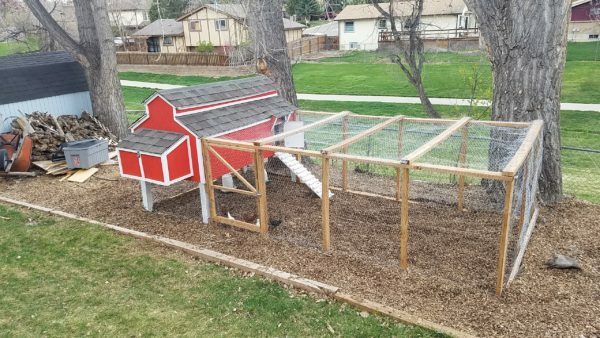 She made her coop half as big because she only needed it to fit 5 chickens- great idea! I love the smaller size! Here’s a very patriotic build from Earl and Shelley. Definitely one of the most unique builds I’ve seen of this coop! Earl used free pallets and reclaimed fence materials from a local fence company. Earl spent 23 years in the US Navy, and he added some fun elements like those ropes, inspired by his service. Wonderful build, Earl & Shelley! 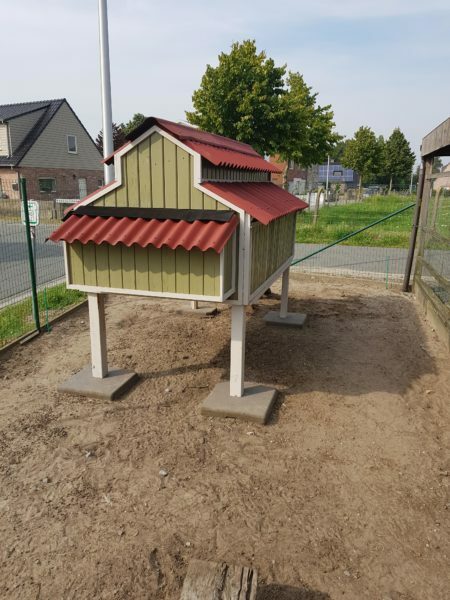 This cute coop was built by Kris in Belgium. I can’t believe my humble chicken coop plans made it all the way from Northern Utah to Belgium! I wish I could see this in person! It turned out great. Thanks for sharing, Kris. I love the way Kris added extra roosting bars inside the coop. The hens will love that! Here’s a nice build by Cindy from South Dakota. I like how she split the side into two pieces, so she can open half at a time instead of the whole side. Very nice build! Here’s another darling coop built by Andrew. He split the side into two doors, for easier cleaning. He said he can pull the chicken run up to the coop if he wants. Such a great build. Thanks for sharing, Andrew. HP customer service Phone Number -contact for hp customer support Number and get quick solution for all Hp product issues Like HP Printer, HP Laptop, HP Desktop Get Instant Support for HP Customer service Our expert technicians are available 24*7. One more thing. I was looking over the plans and don’t see any mention of the door for chicken entry and exit. What are the dimensions of this door? Am I missing this part? Are there any dividers in the nesting box, or is it just one open space for all chickens to nest? I am getting materials and plans together to start on this, this weekend. If you need a online apple support then you can choose us or get in touch with us at apple help number. Our services offerings include diagnosis and repairs to installation and maintenance services for Macbook, iPhone, iPad and other Apple devices. I’m just doing the last minute studying on your chicken house plans and I’m curious about something. 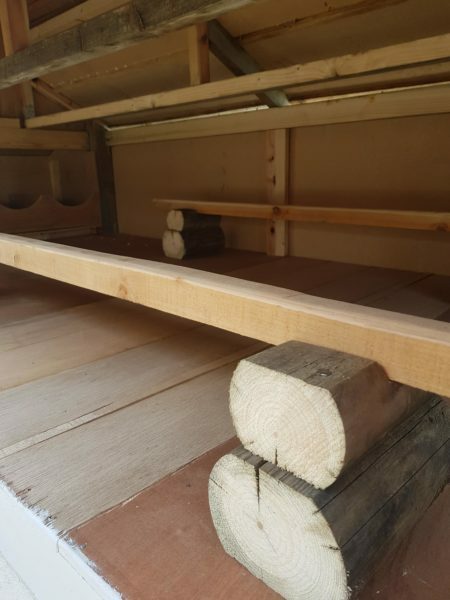 It looks to me like if you cut the stretchers to 85″ and have each 4×4 measuring 3.5″ that your total length will end up 92″ instead of 96″ and you would end up cutting 4″ off the end of each piece of plywood that you put on the roof. Am I missing something? I’m really thinking of making the stretchers 89″ so that the total length will be 96″ but I’m not an experienced builder so i’m not sure if there’s something I’m not seeing in the plans. Thank you for your comment. Since we want our roof to be 96″ long, with a 2 inch overhang on each side, we need to reduce the rest of our coop by 4 inches in length. This results in the floor of our coop being slightly shorter than a standard sheet of plywood. Hope this helps! Hi, thanks for the fantastic plans, I built the coop and the chickens are moving in shortly. Modified the dimensions a little to be smaller (3×6) for my available space. Question on the nesting box lid – in order for the box’s lid to be able to open, the green roofing on the lid needs a half inch gap between the top edge of the lid and the coop … when the lid is open, that gap closes and the roofing is pressed against the coop wall. But when closed, that gap leaves about a half inch of the lid’s osb exposed. In your pics, it looks like you solved that problem but I can’t tell with what. Did you smear in green caulk? Wondering how you addressed it. Again, thanks for the plans, it was a fun project. Hope my question makes sense. You are right, there is a small gap. I simply painted that portion of the OSB with a waterproof paint. Caulk would also work. Do you worry about predators going in through the door? is there a way to close it? You could build a door, if you’d like. We don’t have many predators in our area, and our coop is fenced in, so that isn’t a concern for me. But a door could easily be placed over that opening. The coop lacks windows for natural light. Will this be a problem if I plan to winter the chicken in the coop? In the winter, we place a heat lamp inside. It seems to work well for our hens. I opted not to place windows in the coop because I didn’t want to worry about cleaning them or replacing them if they happened to break. Hey this coop is great! I just got done building it. Question…does the eve ventilation work ok for you? I live in Indiana and it gets cold and also pretty hot. I thought about adding some vented windows if needed. Thanks! I’m glad you were able to build the coop! I’d love to see pictures (nat@thecreativemom.com). The ventilation has worked well for us. I haven’t heard my hens complain yet- LOL. In the winter, we place a heat lamp inside which seems to help for warmth as well as light. In the Summer, the coop is mostly shaded during the hot hours, so I’m not too worried there. Natalie can you please explain to me what a fence bracket is and where do they go ? I have never built any thing out of wood before. I live in the UK and have looked in my local DIY store but could not find any fence brackets ! So i am thinking that they are called something else over here , if I know what they are used for I can to my local lumber yard and ask. Looking forward to your reply many thanks Deborah. Maybe hey are called fence clips? They fit a 2×4 vertically. Little metal brackets typically used to place 2x4s in between fence posts. I wish you would update your supply list since there are clearly discrepancies found and admitted to in the comments section. This is a big build for novice people and just winging it becomes expensive and frustrating. I will post a pic when complete. Thanks for the plans. It’s going to be super cute. I have made updates and edits as the comments have come in. There should no longer be any discrepancies in the plans. It is a lot of information, so I hope you’ll forgive a couple of errors here or there. Overall, I think we have made the needed changes and everything should work out in the plans. I hope this helps! Nice coop building it. Do 2x4s go under the rafters on the long side and then. 1×2 under that? Also I see no mention of using the 2×8 6′ that I bought. The 2×8 is for the ramp up to the coop. If you follow the plans, you should be able to tell on the 2×4’s under the rafters. Good luck. The 2×8 is for the ramp up to the coop. 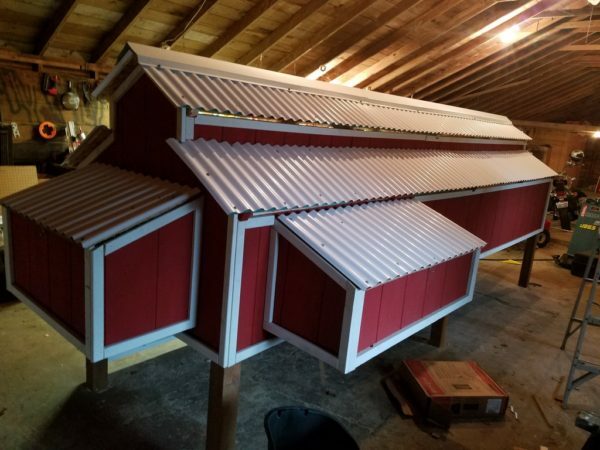 Just about finished with my coop. I am working on the hinged side panel. As I was measuring for cutting the two pieces for that it occurred to me that the piano hinge for that side would have to be screwed to the vertical edge of the 2×4 ledger in order for it to open completely and hang vertically as shown in the photograph. The problem here is that the 2×4 ledger is 1-3/4″ wide when cut per the instructions. This would leave a 3/4″ gap at the bottom of the panel when closed. Should the 2×4 ledger be only 3/4″ or actually the same as the thickness of the siding? Great question. If you cut your 2×4 according to the diagram, you will be fine. Remember that we framed out the outside of our side panel that folds down with 1×2’s (see the top paragraph of page 9 of the plans). If you are worried about a gap, you can measure your side panel thickness (with 1×2 frame) before you cut your 2×4 ledger and plan accordingly. I built mine according to the plans and haven’t had any problems. Well, it came to me like bolt of lightening. I neglected to include the 1×2 trim piece. It is still a little shy as the plywood siding is short of being 3/4″ like all lumber these days. After starting to build this coop I realized that the Supplies List, instructions, and pictures were at odds with each other. The supplies list has 2 – 4X4 posts, while the cut list has four. Were your posts longer than 8 ft., i.e. 10 ft. or longer and cut to form two posts each? The upper 41 in. cross pieces are 2X4 in the picture but the instructions indicate 2X2. The number of fence brackets matches with the use of 2X4s. I see you have clarified the thickness of the OSB flooring which I questioned. There doesn’t seem to be anything listed to cover the OSB flooring. It occurred to me that using OSB for the flooring without covering it would lead to problems with wetness occurring and damaging the OSB. Perhaps you painted the OSB. I, for one, try to never use OSB for anything because of its propensity to swell when wet and not rebound once dry. Plywood, actual plywood, carries a 50% cost penalty which for this project adds less than $20. Love the look of this coop. I failed to list the lengths of the 4×4 posts- though you are correct again, good catch! I used 2- 10 foot 4×4’s for my corner posts. I had issues using 2×4’s for the upper 41″ boards. If you use 2×2’s as indicated in the building plans, you will be fine. I did make a mistake on the OSB measurement. Either 1/4″ or 7/8″ will work, although I in fact used 7/8″- you are correct. I didn’t cover my OSB flooring, because I don’t anticipate it getting wet, and after all, it’s just a chicken coop anyway. But you can use laminate flooring or a paint safe enough for chickens to seal the wood, if you’d like. I’m sorry you had trouble finding the download link. If you click where is says, “Download full plans here: Chicken Coop Plans.” you should be able to download them. WARNING: Parts list 3 sheets of 1/4″ OSB. The builder actually used what appears to be 7/16″ OSB. You can see this by observing the side profile of the OSB in the picture with the framing square/ruler. Thank you for the comment, Matt. Either 1/4″ or 7/16″ OSB will work fine. I believe you are correct, I used 7/16″. Thank you for catching that. If you are worried about the cost of the piano hinge, you may use 3 barn door or fence gate hinges. This is a pretty in depth build, so feel free to improvise as needed. You can also cut costs by using a different type of roofing, or using cheaper paint. All together, $400- $500 is a great deal for a coop this size and quality. Unfortunately I can’t. 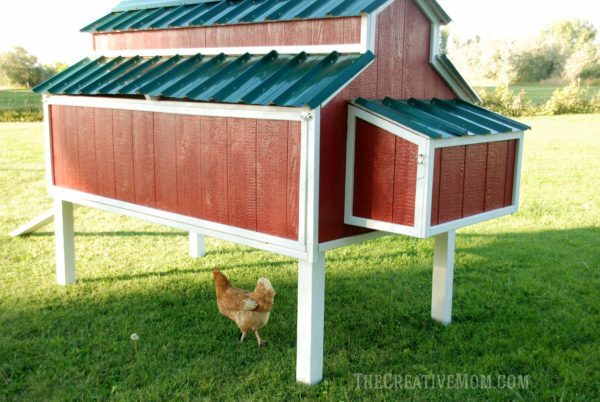 There are a lot of chicken coop ideas online if you need a bigger coop. We built this on our patio then when it came time to move it where we needed it to be it was so heavy! Problem solved with 4 wheel barrow wheels installed on the legs. Now it moves like a dream. The plans were very helpful! Thanks! What a great idea! I would love to see photos of the completed project! First I’d like to say thanks for posting the free plans for this coop they are well laid out and easy to read. However it would be more beneficial if your plan matched your pictures. I ended up doing an odd combination of the plan and your pictures along with some fabricating myself. It just would have made more sense if the measurements were laid out a little better. Hi Joe, I’m sorry if you had trouble with the pictures matching. We made some alterations to the plans after we built the coop to make it easier to build and provide a better structure for the coop. I noted where there were changes that varied between the plans and the photos. If you follow the plans, you should be good to go. 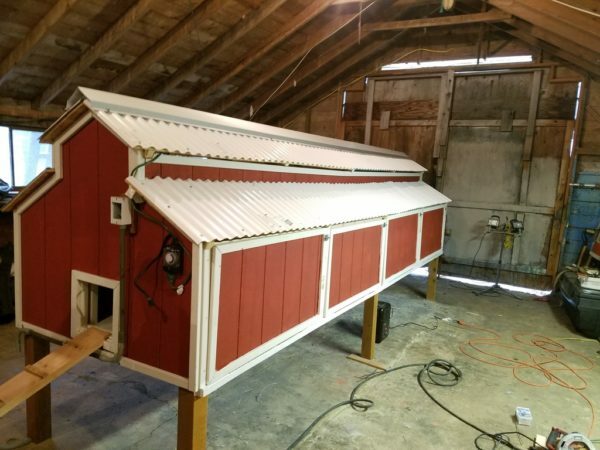 We built this coop a year ago and are looking to build another. It is very hard to keep clean. Love the design, but the functionality is less than optimal. It is very secure and has kept the girls safe. I’m sorry to hear that. The thing we love most about this coop is how easy it is to keep clean! Could you tell me what part you’re having trouble cleaning? You could use a stiff 1″ x 1″ plastic coated metal mesh for the floor in the main area and just straw hay the nest box. Then use a wheel barrow under to collect poop for the garden! That might prove to be a bit drafty in places that have cold winter weather. I’m not sure the birds would like walking on it, either. Great idea! I would love to see a photo of the coop, if you’ll send me one. For the 2×2 and 2×4 truss on the very top roof, how did you make these cuts, the images on the blue print schematics do not match what is shown in the real life pictures, the 2×2 sit on top of the cross beam 2×4 in real life pics….can you take pictures of from the inside of the very top roof and post them so I can see how you cut the wood? It is best to follow the plans, add we made some changes to the plans after we built it. The way the plans are will make it easier to build and sturdier. Super cute coop! Awesome job. Thanks so much, Amy. I appreciate it. Thanks for the design plans–one question–what about food and water? Do you hang feeder/waterer from chains in the roof? We have the food and water outside in their chicken run. You could surely put them inside, but we find it keeps the coop cleaner to keep them outside. 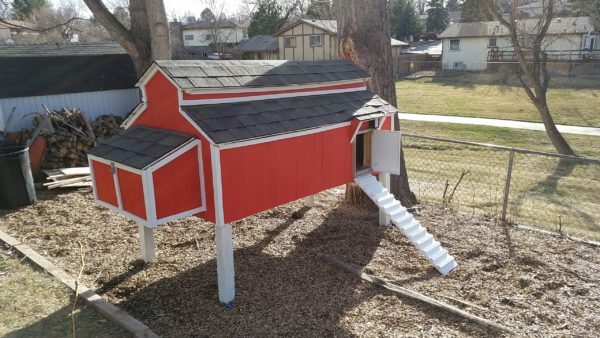 I’m new to your blog and to chickens, but this coop looks perfect! Where do the chickens roost? Is there room for them in the center peak? They actually do roost up in the eves quite often. We also added some roosting bars inside the coop and outside in the chicken run. We added some roosting bars inside the coop later. Also, we have found that it doesn’t matter how many nesting boxes we have, all of our hens smash into one area anyway. We haven’t had any problems with them using this coop with the nesting box for laying. Hi Nan, the ventilation is under the eves. I really love this coop design. I have a question about the materials listed. The list calls for 3 sheets of 1/4′ OSB plywood. This seems like it would be very flimsy for flooring and roofing. In the photos of your build it looks like you are using either 1/2′ or 3/4′ OSB. I’m wondering if this is a typo in your list. I have already bought the materials as listed but don’t want to start cutting yet if this is the case. Please let me know. Good catch! You are right. I used 1/2″ OSB, not 1/4″. Thanks for the comment. 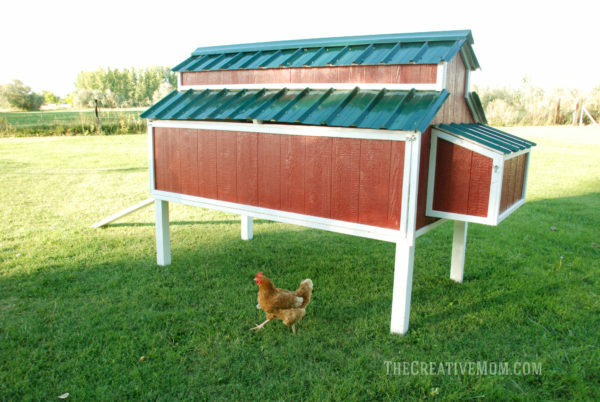 how much would you say that chicken coop cost to build? Thank you! I would say this build cost around $400. Of course you can do it cheaper if you have some scraps laying around and use paint you already have. The roofing was also a big expense, so you could go cheaper if you used shingles instead of metal roofing.